Under the Wave, off Kanagawa (Japanese: Kanagawa oki nami-ura), popularly known as ‘The Great Wave’, is the most famous of all Japanese prints. It was designed by artist Katsushika Hokusai in around 1831 and issued as a popular colour woodblock print. Since then it has inspired countless reimaginings. Sometimes, it’s all about perspective. Although the Great Wave is often seen as typically Japanese, in fact it mixes influences from both east and west. Hokusai’s imagination had been captured in his youth by his discovery of European-style perspective. Now, aged about 70, he adapted European perspective in a very inventive way, playing games in the image. Katsushika Hokusai (1760–1849), Under the Wave off Kanagawa. Colour woodblock print, c. 1831. Acquired with Art Fund support. The Great Wave is actually part of a print series called Thirty-six views of Mount Fuji (Fugaku sanjūrokkei). What you might have mistaken for another wave in the background is in fact snow-capped Mount Fuji, the highest mountain in Japan. Also, look closer and you’ll see fishermen in boats, about to be swamped by the sea! It originally cost the same as two helpings of noodles! At the time it was made, a print of the wave would be worth no more than two helpings of noodles. The series was so commercially successful that the publisher extended it with another ten prints, printed this time with black instead of blue outlines. Several thousand impressions were taken of the design from the cherry-wood printing blocks, literally as many as the publisher could sell. The British Museum has several impressions of the Great Wave, including this fine early impression. The colours Hokusai used in printing the Great Wave are significant, particularly the blue. It comes from Berlin and is called Prussian Blue. 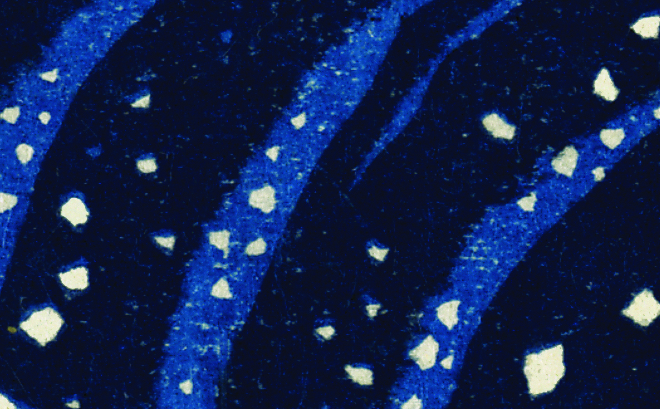 Prussian Blue in a detail of Hokusai’s Great Wave. The print series was the first to exploit the new pigment, which had recently become cheaply available from China. It provided Hokusai with a strong blue for both sky and water and had the added advantage that it did not fade. Its use also made the print extremely popular in Japan, as the Japanese were very enthusiastic about anything that came from somewhere ‘exotic’ like Europe. 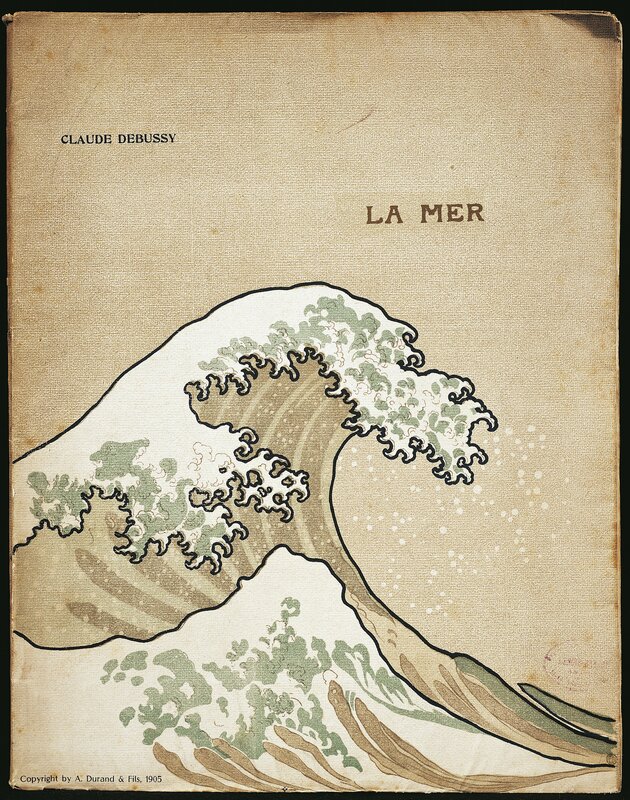 Cover of the first edition of Debussy’s La Mer. A Durand and Sons, 1905. Photo: DEA/G DAGLI ORTI/De Agostini/Getty Images. It’s well known that many western artists were inspired by Hokusai, from Monet, Van Gogh and Degas to Whistler, Warhol and Hockney. French composer Claude Debussy (1862–1918) was inspired to write his own ode to the sea, titled ‘La Mer’. The cover of the 1905 edition of this orchestral work featured an illustration based on Hokusai’s wave. Cookie Monster Great Wave. © reddit.com user Put_It_All_On_Red. The wave is so visually familiar that it has been adapted to feature in a series of memes, from pugs to Godzilla. This one shows the Sesame Street character Cookie Monster – sea is for cookie! Nom nom nom. It has its own emoji! You might have noticed the nifty little pieces of art on your phone’s keypad. The wave one is based on Hokusai’s original. The Alena Akhmadullina show Spring/Summer 2016. Mercedes Benz Fashion Week in Moscow, Russia. Photo: Oleg Nikishin/Epsilon/Getty Images. Fashion designer Alena Akhmadullina has even used Hokusai’s iconic work as inspiration for a variety of clothes. 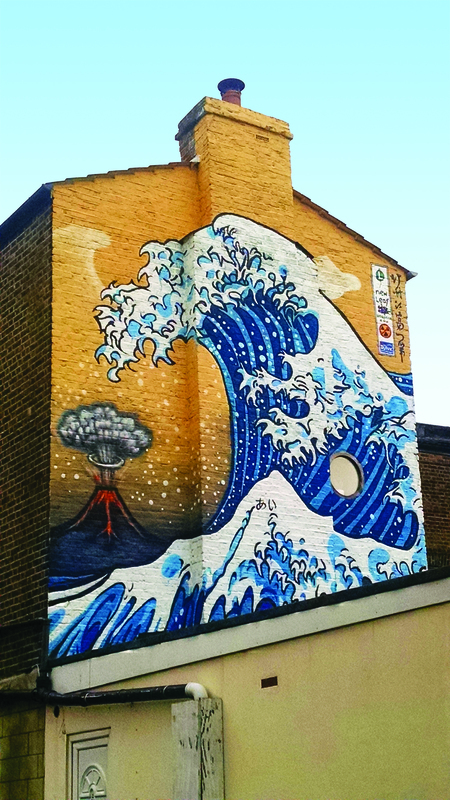 Great Wave in Camberwell by Dominic Swords. The ‘Great Wave’ can also be found crashing against a brick wall in Camberwell, south London. It was created in 1998 by artist Dominic Swords who lived in the building. Unfortunately in 2012, part of the mural was badly damaged by a fire. Volunteers loved the mural so much that they set about to restoring it – that’s why you can see a tiny volcano on the burnt side of the wall, looking fierce under the wave! You can find out more about Hokusai’s Great Wave in this book, available in the Museum shops. There’s also an entire Great Wave range featuring everything from umbrellas to art prints. You can see Hokusai’s Great Wave – and many of his other beautiful works – in the exhibition Hokusai: beyond the Great Wave, on display at the Museum from 25 May to 13 August 2017 (closed 3–6 July), supported by Mitsubishi Corporation.